This game is amazing! The graphics are the best than any horse game I have played. You get to explore a huge reserve with 21 Wild Mustangs you can tame! You can take part in competitions, care for horses and foals, and solve exciting mysteries! When you finish the game, you can start all over to improve how you played the game. The game is very exciting, you get to ride horses and everything and you also get to travel to many places. I think this is a very good game because when I was younger I played it and it was so much fun, every time I got home from school I always played it. this is a very good game and I suggested because I believe it's a five star game this game has a very good storyline and Great characters and the screenplay is very well played out this is a good game for anyone who really wants to go on a adventure!! Really fun game! I beat it pretty quick but wanted to breed the horses after but can't figure out how to get the days to change so the foals can age! HELP! i beat this game in 1 hour ha ha ha ha ha you need to get it on the computer u get to breed and you get to own like 25 HORSES!!!!!!!!!!!! I love it, it's so awesome! its an okay game. you do get to tame wild mustangs but you do not get to breed on it for the wii and it doesn't let you ride just ANYWHERE. it's a good game though but if your looking for a more challenging game then you should skip this game but if you are looking for an easier game it would be a good one. i got this game when i was little but it fascinated me. so that is just my opinion! i have never played this game, it sounds fun but if i buy it off the internet it could not work, so i am thinking about buying it and a few other horse games. i am horse crazy, i have always loved horses. i love this game it was fun. it took me a while to find adonis and it was hard to get him but eventually i got him. everyone who says this is a bad game you must be wacko. it's the best game ever. i ride myself so i think i would know i have the pc one and the wii and so what if it takes you 3 days it's still fun so if you want to get this game i would go and buy it now like right now. it is sooooooooo cool (in a good way) the way they made this game makes you feel like you are in it. i thank the maker of this game 1,000,000,000,000,000,000,000 times it ROCKS!! I have played it million s of times. I owned it for the longest time. I have the game so I need not download it! But for those who do need too, then I recommend u do. I like the graphics but the tails are really stuck together. I have this game too. At first it was pretty fun, but after awhile it gets really easy, of course. It's still okay to play, just not as fun because it got so easy, and it only took three days to complete. But the graphics are pretty good overall. I guess I would give it about three stars, maybe more. Oh, and Anonymous, the people making grunting sounds in some parts is normal. Never played before but, I might get it for my birthday! It seems fun! In my game, the people make grunting sounds instead of talking in some areas, and talk in other areas. The captions show that the people should be talking. Is this normal, or is there something wrong with the game? I also had a horse up in the trees and had to reset the game and start over, to fix. This. Any help would be great. Thanks. the game only took about 5 hours to beat(combined), It was fun but not long enough for me. i haven't played this game but from comments i think i might get it. by the way what's adonis? i keep hearing about it but have no idea what it is! I went through the whole game, and it took about 2 days to complete. At the end, I couldn't find the horse named Adonis, even though I looked exactly where he should have been. It was really fun but too short for my liking. I can't find Adonis, someone help me plzzz? it's a great game, but i wish i could breed horses on the wii version. but over all... AMAZING game. I liked this game because it was really fun to be able to tame the wild horses that were there on that littel ranch. I also have completed the game several times although you can't change your character, it is fun to be able to brush and wash the wild horses. I would definitely recommend this game to any horsecrazy girl out there. I've seen the game and read some reviews and it looks like a really cool game. I mean, besides the fact that people keep saying it goes to fast and then gets boring, it seems like a pretty fun game for those who like horses. I have this game, too. It's totally awesome! I got this for christmas a couple of years ago and it is a lot of fun to play. The whole horse taming thing is very unrealistic. All you have to do is wave you hands around for a while then give it's favorite food, scratch it's favorite spot then you can RIDE it! It's also really short. OTHERWISE, Really fun! It's a great game but it's kinda hard the back up. And when your horse can't make it over a jump it's kind of a hassle to get her back and cantering and ready to jump. But otherwise I love it and beat it a long time ago. this game is really fun but I can't beat the bonus games. need help! i would want to ask which horse game for wii, is the best? most realistic? in which jumping and going on compensation are included. His name is Adonis, he is silver and white. He is the best horse ever on this game! it was to short, they should add of some more things. the first game was very well done but this one lasted only an hour. it was fun and all but to short and the things you could do weren't all that great. Its good, great graphics and fun and realistic. but easy, like way too easy, one day beat the game easy. i like how you can tame wild horses though. its fun and well like i said, eh. Hi I am a newbie to this game so I just want to ask, can you play this game in SA? I ordered it on Amazon.com but it doesn't work on my Wii in South Africa. I don't know whether to get this game it might be too young for me. I think that this is the sequel to another horse game I have that is very enjoyable it has all the same characters but the black horse at the start was named differently because you named it yourself. in the last game I called it Shadow Knight but in this its called Altai, so should I get it? to find the mystery stallion you have to beat all the additional games on it next to where you get to tack up. then go to section 3 and he will be there. I love Petz Horse Club so 1,000 so much. It was a fun game for the most part, but it got kind of boring and demanding. I hardly play it anymore, possibly because It's just so... unprofessional in the horse world. would like that game but my dad and mum said you already have horse games, download games and a real horse named Troy. but i will get another game that is better. i tried playing it but i couldn't. i got pretty far. so i was trying to get to a horse but the horse was in the air. it was flying. i don't think that was supposed to happen. whats wrong with the game? It was good, had a plot line, but I beat the game in a day. I really enjoyed this game. It was very fun, however I felt like it was a little bit too easy. I finished it a few days after buying it. I finished the game and i loved every minute of it. Riding is very realistic. I haven't tried this game but it looks great. I love the game but when you beat it there is supposed to be this stallion that you have to find and tame. and it is the hardest horse to tame, but i can't find it anywhere, does anybody know how? I'm wondering, is it similar to Imagine Champion Rider? Or is there a difference? Cuz I've watched them on youtube, they look the same. that u could have more horses that u can tame. and that there are more horses with aproch leavels that are hard. this game is so cool, just wondering is everybody's horse named altai? Do you need pretend money to play this game? I love this game and i think it is awsoume, but I got realy frustrated at the end because u have to find some horse and what i have read about it is that this horse is amazing. Over all I really think this game is fun and it is coolish. I'm not really sure since I got mine from Christmas.. The cheapest price you could get it from is by going to stores like Game Stop. Or just try looking for online websites that have them up for bid/sale. 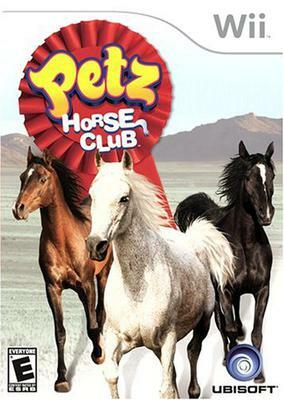 Petz horse club is the beeest game. You get to do shows, tame wild mustangs, cross contry, and much,much more. If you're a girl like me (a horse lover) you'll LOVE this game . P.S. It is difficalt in the beging,but don't give up! I wish you could name the horses and breed more foals. Really awesome! I got it for my birthday and it is SOOOOOOOOOOOO fun! I played it a lot when I got it. Its a really great game if you (Like me) Don't have your own horse! I definitely should try this game. It sounds GREAT!!! Thanks for posting this!